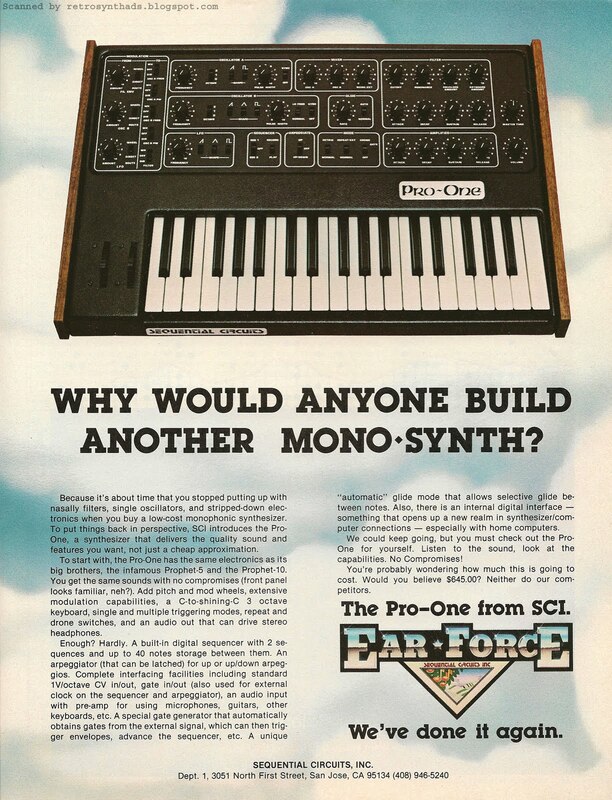 Sequential Circuits Inc. Pro-One synthesizer advertisement from page 27 of Contemporary Keyboard March 1981. I've been experiencing a lot of déjà vu lately. First it was that keytar blog post that knocked me square back into the 80s, and now this. 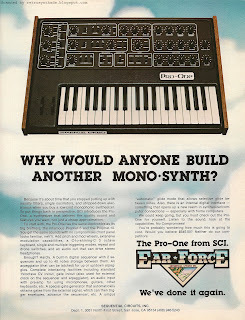 Although this most excellent 'Ear-Force' advertisement from Sequential Circuits Inc. came out in 1981, the same question featured in this ad could just as easily have been inserted into an advertisement for one of the many recently released monophonics. "Why would anyone build another mono-synth?" It may have been a valid question in 1981. Maybe. But, really, I don't think you need to ask that question today. We've all finally learned why. It's because of how great that first round of mono-synths were. Maybe it just took a while for some of us (including the manufacturers) to catch on to that fact. I bought my first analog mono-synth - a used Pro-One - in a mall music store way back when. I didn't know much about analogs back then, but just one look at all those knobs and I knew I wanted it. Since then I've been lucky to play with quite a few of the first-rounders. And my first experience with the reintroduction of monophonic synths was propbably in the mid-90s with the release of the Korg Prophecy - an early virtual analog synthesizer that came out of nowhere to deliver some juicy digital monophonic goodness. And ever since, I've noticed that the new round of mono-synths coming out have gone back to their 1970's/80's analog first-rounder roots. Gear like Tom Oberheim's recent re-release of the SEM or Moog's Voyager. Dave Smith, founder of SCI and creator of the Pro-One, also went this route, releasing a whole new batch of mono-synths - directly comparable to his originals. I'll admit, his first mono-synth under the DSI name, The Evolver, doesn't really compare with his older products (although I believe they do have curtis filter chips :o). I picked up one of the early Evolvers right off his original Web site because my local music store wouldn't bring them in - I just couldn't convince them to bring it in even though it is one serious synthesizer. But his later products - the Prophet '08, and then the Mopho and Mopho Keyboard, didn't have a problem making it into my local music store. Probably because they did follow a very similar evolutionary tech- and time-line to his originals - the Prophet-5/10 and then the Pro-One. Pro-One ad: "... the Pro-One has the same electronics as its big brothers, the infamous Prophet-5 and the Prophet-10"
Mopho Keyboard Web page: "The voice architecture is similar to a single voice of the Prophet '08..."
The modulation capabilities is one of my favourite features of the Pro-One, and luckilyDave Smith decided to carry the extensive modulation traditions to the Mopho too. Of course, with the Mopho you also get more of everything else. LFOs, envelopes, etc... and all the benefits of current technology - three banks of 128 programs (384 total), software editor, USB, and midi. So, does it replace the Pro-One? Well, I demo'd the Mopho Keyboard down at my local shop and, as expected, it does sound great. Technically it might replace the Pro-One, but not in my heart. I won't be selling the Pro-One anytime soon. But I will be buying a Mopho. And probably the desktop unit if I can locate one locally. I fell in love with desktop modules when I first came across the Kawai K1m. I loved that vector joystick and I can still hear that choir/string patch... Aaaaaaaaahhhhh.